Uses : The roots are astringent and vulnerary and useful in intestinal ulcers, rickets, haemorrhages and diarrhoea. The leaves are useful in treating wounds, ophthalmia, hepatopathy and haemorrhoids. The flowers are bitter, astringent, sweet, cooling emollient aromatic, cardiotonic, anti-inflammatory, expectorant, digestive, carminative, , depurative, febrifuge, intellect-promoting styptic, rejuvenating and tonic. It is useful in asthma, high blood pressure, bronchitis, slow circulation, diarrhea, dysmenorrhea (painful menstruation), cough, fever, fluid retention, Indigestion, insomnia, palpitation, stress and urinary tract infections. 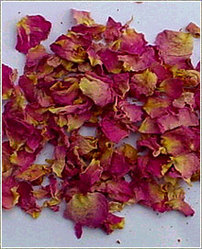 Several rose products are used to make creams, lotions and other cosmetic uses. It is also used in potpourri as a pleasant cent. Mix with vegetable glycerine for moisturizing use. Mostly perfumery, also in toilet preparations, lozenges and toothpaste. Homes use in butter, syrup, jams and honey. Rose water is used in desserts, pastries and cakes. The flower buds are astringent and are used in cardiac troubles and as a tonic and aperient. Gulkand made from the petals possesses mild laxative properties and is useful in sore throat and enlarged tonsils.